Nolan Valleau didn’t play a single game for approximately 18 months. But once the red-shirt freshman returned to the ice, he quickly started to play well again. The defenseman has provided Bowling Green with plenty of offense and improving defense during its 3-1 start. Valleau has at least one assist in every game, totaling an NCAA-leading six assists. The 6-foot-1, 181-pounder has an on-ice rating of plus-4 and has been even or better in every game, including three plus games. A player receives a plus every time he is on the ice when his team scores a goal and a minus every time he is on the ice when the team allows a goal. Power-play goals are not included. All of this after he didn’t play last season and only practiced with the Falcons during the second semester. Valleau originally committed to Ohio State in December 2012 but decommitted from the Buckeyes in April 2013 after head coach Mark Osiecki was fired. He eventually decided to join the Falcons in August last year and became a full-time student at BG, but he didn’t meet academic requirements and was ruled ineligible by the NCAA. Valleau is an offensive defenseman, something the Falcons haven’t had enough of the last four seasons. The native of Novi, Mich. makes smart plays, passes and shoots the puck well, and can join the rush because of his excellent skating. The Falcons are averaging 3.5 goals this season, compared to 3.1 last season and 1.9 during the 2011-12 season, Chris Bergeron’s first as a head coach at BG. Valleau’s offense from the point is helping the Falcon power play, too. BG is scoring at 30.4 percent with the extra man, compared to 18.9 percent last season and 8.9 percent during the 2011-12 season. The 21-year-old is working to improve his defense. He’s already killing penalties. Valleau used last season to increase his weight and strength, and get in better shape. “He competed hard every day, and that’s a hard thing for a young guy to do, knowing he wouldn’t get the reward of playing games on the weekend,” Bergeron said. BG was aware of Valleau when he committed to OSU, but Bergeron said the coaching staff didn’t talk to him during the recruiting process because it didn’t have room for another defenseman on the roster. When Valleau elected not to attend OSU, the Falcons were immediately interested. Yet, Bergeron and his staff still wanted to make sure he was a good fit for BG. 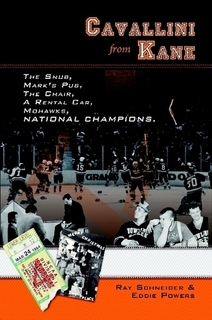 The coaches were aware Valleau had some academic issues and they had heard concerns about his work ethic off the ice. After the BG coaches talked to Valleau in person, they were satisfied he’d be a good addition. Valleau eventually chose BG after also receiving interest from Minnesota State, Lake Superior, Western Michigan and Penn State. Valleau has 3.1 grade-point average, majoring in sport management. “You make room for a player like Nolan,” Bergeron said. “Nolan has made some changes from a personal perspective and a willingness perspective over the past three or four years, and we’re seeing the results of those changes in the willingness. Valleau came to BG after playing the 2011-12 season in the North American (Junior) Hockey League and the 2012-13 season in the United States (Junior) Hockey League. He played for Des Moines and Chicago in the USHL, totaling eight goals and 18 assists in 64 games. 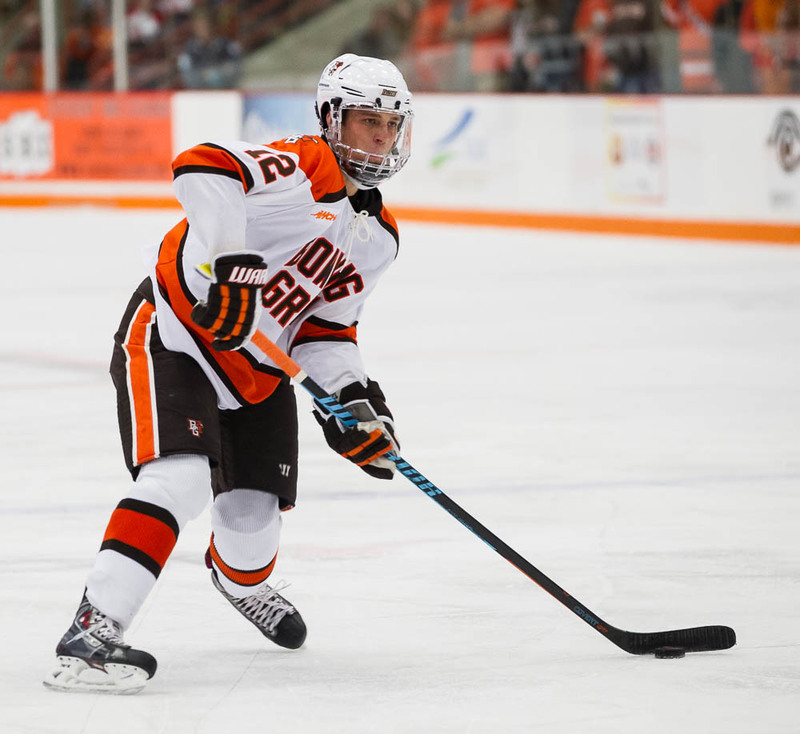 He was familiar with BG because he was a teammate of current Falcon freshman Brett D’Andrea with Port Huron in the NAHL. “I just realized that if I wanted the reward at the end of the road, I had to take care of the academics and off-ice part of it,” Valleau said. The next challenge for Valleau is to be great every day, both in hockey and in the classroom. “We like all kinds of layers to his game and he’s just beginning,” Bergeron said. “He has a chance to be a good player. Every day, you want to be the same or at least close to your level as you can be, and he’s at a pretty good starting point. 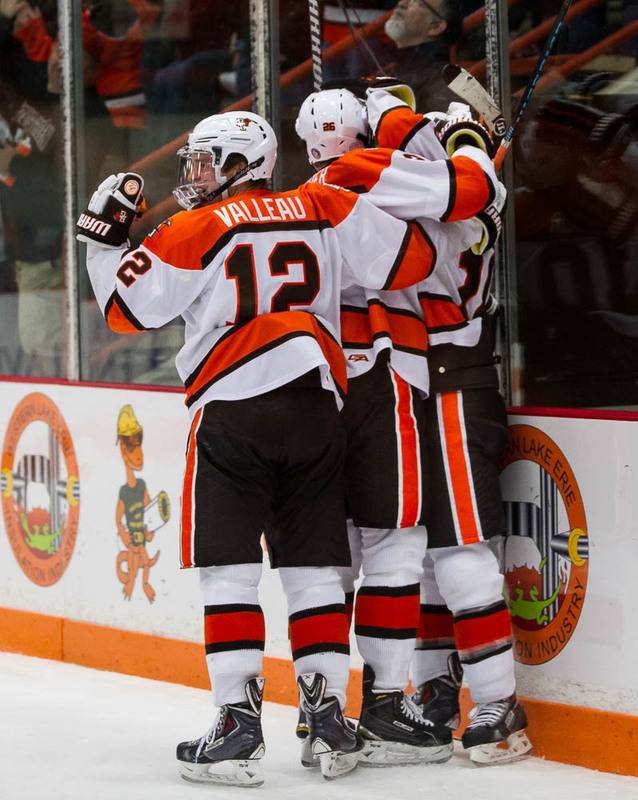 Next for Valleau and BG is a nonconference series this weekend at Clarkson.